It is a love story that transcends time. A young Andrea is playing the cello when a wall in her room suddenly cracks open to reveal a young boy from another time. She tries recreating this moment several times after that (sometimes successfully, sometimes not), to the point where she questions her sanity. It is only years later when she discovers that the young boy she saw was Isaac Newton – yes, that Newton who discovered the laws of gravity. She then starts to receive letters from Newton, which eventually guides her to more encounters with Newton, which led to her being transported in time to be with Newton himself. 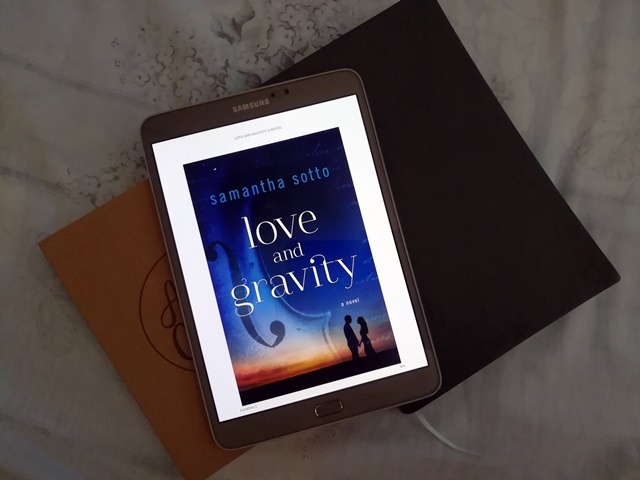 Love & Gravity is the second book by Samantha Sotto and it is, in my opinion, even better than her first work. I don’t want to say too much about the events of the book, because that would mean revealing things that are best discovered when they are being read. What I can say however is that without visualizing Isaac Newton, I felt that the book was very romantic, and I was rooting for both characters to end up together (as impossible as it may have been). No offense meant to Mr. Newton, but most of the illustrations/paintings of his likeness doesn’t exactly scream romantic lead material. If I were to dwell on the visual in my mind, it wouldn’t be that romantic at all, so I chose to block that from my mind. As with most stories that involved time travel, it’s best not to get too serious about the laws of time travel or you’d be poking holes at the story at every turn. If you let yourself be drawn to the story itself instead of looking at the logic of things, it is a good story. Dwell on the time and logic bits too much and you’d think it’s a dud. But since I am more of a romantic, I was more the former than the latter. I just wish there was more to show the development of the romance between Andrea and Isaac. I felt like the encounters with each other was not enough to make them fall in love the way they did. Their love felt a little superficial, something that started as an obsession because of their time travel encounters. I think their love only developed when they were actually together. I thought it was interesting to imagine a historical character in a more personal light, to see his struggles and his dreams and the kind of personality he had. Yes, it was mostly fictional, but it was still entertaining to imagine since the only thing I know about Newton is about the law of gravity. I surprised myself that I liked the male lead more than the female one. For some reason, I found myself rooting more for the guys in this one. I was not just rooting for Newton but was rooting for Andrea’s best friend Nate too. I know that Andrea, Newton and Nate were a love triangle, but I still found myself rooting for both guys! They both deserved a chance! My favorite part of the book was the twist at the end. That reveal about the story was also a nice touch, I did not see that coming at all! It was sad, touching and hopeful all at the same time. I think that was what made the book extra-special to me. It was a good way to end the story and tie up loose ends (and gave an ending that satisfied me). If you like romantic novels with a touch of time travel and historical fiction, you will enjoy this book. Just do yourself a favor and don’t look at old Isaac Newton photos before reading so you won’t keep picturing the old guy when you’re reading the book!